Our modern fleet of vehicles features all the latest technology. Plant services are available on an operated or hire only basis, with short or long term arrangements arrangements on offer. Whatever the contract, Tripod Crest can provide a suitable paver. Our machines range in size from Vogele Super 800s to Vogele Super 1803/2s, also including Vogele 1302/2s and the compact AFT 270 E/G. 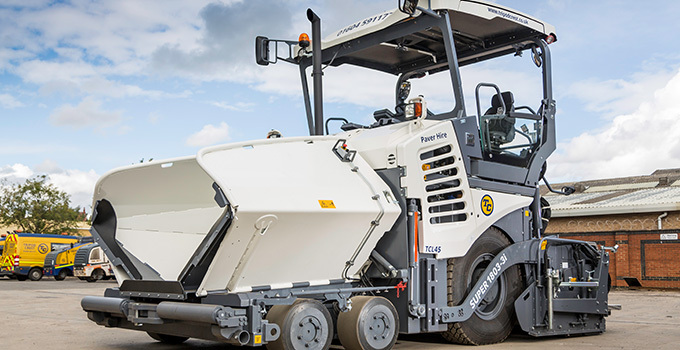 So we can service small areas of public realm such as cycle tracks and footpaths through to large expanses of surfacing – offering the most appropriate combination of power and economy depending on the specification. Our operatives are trained to the highest standards and take real pride in their work so however technical the job, customers are guaranteed a thorough, professional finish. The company’s in-house fitter service supports all contracts, and there is specialist advice on hand too. Pavers are delivered by Tripod Crest’s own low loaders from Somerset or Northampton – offering nationwide availability. Customers always receive a reliable, quality service and a ‘can do’ approach from the entire team. This work ethic is the result of 25 years’ experience and commitment to the sector.